I was fortunate enough to be invited to a dinner party a few weeks ago, at a gorgeous remodeled home located deep in Olmos Park. The hosts had impeccable taste, from the local art that hung in their dining room, to the lace table linens, Laguiole cutlery, and Tiffany stem ware. Even the dinner plates were garnished in a stunning mustard yellow pattern designed by Versace. The food, deliciously prepared by Cascabel in Southtown, was amazing. My favorite room in the house was the formal sitting room, where author works such as Mark Twain, William Shakespeare, and Friedrich Nietzsche lined the walls. A special vicinity housed Dr. Suess and Brothers Grimm, and from which family pictures cascaded. Although a casual affair, this get together was well planned and detail oriented. I could see why the sommelier was attracted to this particular couple; like I mentioned: flawless taste. There were a variety of guests, ranging from corporate executives and attorneys, to housewives and oilmen. The collection of conversations was no doubt unique. The sommelier and I had been sitting on some news for a few weeks, gently explaining that I was unable to partake in my favorite varietals due to antibiotic use or upset stomach. In reality, we had discovered that we would be adding another member to our sommfamily, due sometime in February. At this point, we felt like I was far enough along, symptoms in full thrust, that we were safely able to tell our friends why I didn’t taste the Barolos, Amarones, and Chenin Blancs. So out the broadcast came. After an immediate flurry of congratulations and best wishes, and a number of “way to go” pats on the back for the sommelier, my thoughts turned to the reality: two under two. Both working parents. Hazy finances. We were in for a lot of work, and my anxiety started to kick in. 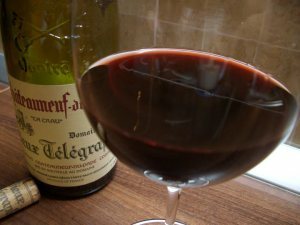 It was at this time that I noticed my all time favorite varietal sitting on the kitchen counter: Chateauneuf-du-Pape. 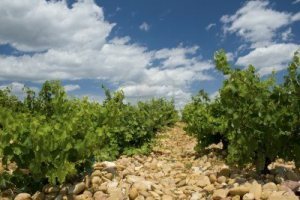 Hailing from the southern Rhone region of France, Chateauneuf-du-Pape, named for the papal vineyards that supplied Rome in the 14th Century, has been considered rustic and of limited appeal in the US. Historically, much of the regions production was blended into several different labels or sold into bulk. In last few decades, however, there has been a surge of estate takeovers and improved winemaking techniques, creating a more appealing wine known so well to my palate. Particularly, I find the rusticity, earthiness, and long finish of the Chateauneuf-du-Pape a welcomed breeze from our Italian themed collection. It pairs well with strong dishes, like lamb or beef donned with mushrooms, onions, and spinach. After voicing my love for the wine, my passion hanging on my sleeve like a sparkling ornament, one of the dinner guests offered me the bottle. “Please take this as a celebratory vintage, enjoy it when you can drink the entire bottle, after your little one arrives,” he said. 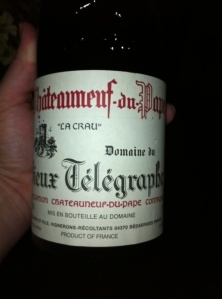 A 2009 Domaine du Vieux Telegraphe “La Crau”, the oilman could not have gifted a grander cru. Known for their legendary terroir, the Brunier family has been perfecting the Chateauneuf-du-Pape since 1898. Now represented by Kermit Lynch, this particular varietal is reaping the benefits of it’s longed labors. Since Chateauneuf-du-Pape really needs at least 4-5 years in the cellar (better after 10 years), I was truly looking forward to opening this bottle of wine after the birth of our next little one. I even concentrated during Prenatal Yoga to develop the consciousness of our mini-somm’s palate. I am big believer of sensory development, after all. Weeks passed and I toyed with posting about my experience in Olmos Park. Then we visited my doctor this past Monday, and found that I had a blighted ovum, an empty gestational sac. 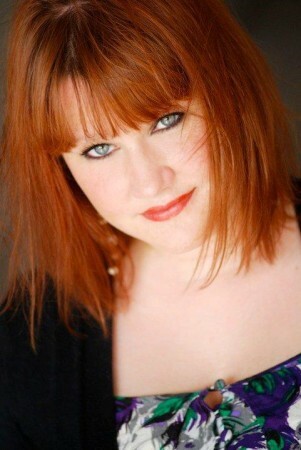 While my body showed all the signs and symptoms of pregnancy,even forming a placenta, my womb was barren. The immediate response was to undergo surgery right away, not because this was the norm, but because my schedule would not necessarily allow me to naturally miscarry. With a surgical option, there would be more control. The sommelier and I did not argue. The very next day I would be no longer dreaming of a larger sommfamily. Of course there are strong feelings about our loss. The Universe has plans for us, although I dare to challenge what they may be. It seems as soon as I accept changes to my personal future, my world is turned upside down and forced to acknowledge a new fate. Needless to say, I am still struggling with the turn of events. First I was anxious; then I understood; then I accepted. Now I am empty. And sad. I think about finding a medium style Chateauneuf-du-Pape to enjoy now, like a Clos St Jean Vieilles Vignes 2006, which can be found at Specs for $55. But it hardly seems fair. I somehow feel like it is not yet time to enjoy my favorite wine. It is as if no one told my body that our little one no longer exists, or rather, never existed. My breasts still hurt and my body aches. It is strange, and I am still besieged with the concept. Instead, I opt for my go to house wine, the inexpensive, yet drinkable Chianti that I have learned to love over the past year. Things change so quickly in our household. A lot has taken place this week. As our family heals, my hope is that the gifted 2009 Domaine du Vieux Telegraphe “La Crau” ages beautifully, so that in a few years, regardless of our family size and situation, we can enjoy the vintage with gladness and ease. It is worth holding on to. Time transforms all (that’s what they say, anyway). In the meantime, drink well, be merry, and cheers.